We are on the brink of a humanitarian mega-crisis unprecedented in recent history. The spectre of famine looms large over parts of Africa and the Middle East. We must act now. What is needed is a broad and massive scaling up of support from the international community. If we treat this as “business as usual”, the long-term cost in human lives will only rise. The consequences of not dedicating the resources to avert these disasters and address their root causes could affect us all. It is estimated that more than 20 million people in Yemen, South Sudan, Somalia, Nigeria, Kenya and Ethiopia are affected by the current crisis. The Red Cross and Red Crescent Movement have been on the ground in these countries for years. We have witnessed the massive suffering. In Yemen, a perfect storm is brewing. Only 45% of health structures are functioning. In one city, Hodeida, the water system is on the verge of collapse, threatening nearly half a million people. Desperately needed goods such as food and medicine are blocked from entering the country. In South Sudan, it is estimated that one in three households is in urgent need of food. In Nigeria’s Borno state, 300,000 children are expected to suffer from severe acute malnutrition over the coming year. Long-term conflict is the common factor linking the crises in Yemen, South Sudan, Somalia and Nigeria; the emergency is man-made. 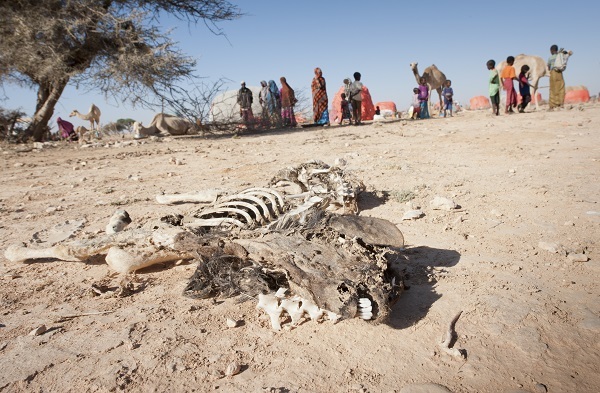 In the horn of Africa, drought is also a central cause, with mass livestock deaths in Somalia devastating entire communities. In Kenya, the rate of malnutrition is above emergency levels in some areas. In Ethiopia, more than five million people still need food assistance. Hope exists: There is still time to avert famine, but speed is essential and substantial financial resources are needed. Humanitarian funding is a tiny fraction of government budgets, and yet absolutely essential to keeping millions of people alive in conflict hotspots. In view of the alarming situation over such a large geographical area, the Red Cross and Red Crescent Movement have come together to respond in a coordinated way, leveraging our respective strengths and diversity to work towards one common goal: to save lives in communities most at risk in these countries. We have been busy. In South Sudan, our teams wade through swamps to meet with families hiding from violence. We distribute seeds and fishing kits so people can feed themselves. Following the recent upsurge in fighting in Yemen, the ICRC increased its medical assistance by 250% to assist people wounded by war. The Kenya Red Cross has been scaling up activities in the distribution of foodstuffs, health and nutrition, cash transfer and animal destocking and slaughter programming. In total, the ICRC and the IFRC will spend nearly $600 million in the six countries, to help more than 7 million people. But no amount of aid money can overcome widespread violations of the Geneva Conventions. States have the power and duty to influence behavior in the right direction. They must try harder. States should not support those who fail to abide by the laws of war. Looking at the long-term, what happens if we do not act now and deal with the causes of this famine? If conflict deepens, if polarization increases, there will be a growing price to pay. First, there will be the massive cost in human life, and the deep suffering and pain for those who survive the backwash of mass death. Second, there will be another increase in refugees crossing borders in search of safety. How would a massive tide of new movement affect a world already wary of migration? At a time of growing uncertainty and fear, we still have a chance to tackle the coming disaster in countries facing mass hunger. By working together, we have a chance to avert this seemingly relentless march towards the abyss. The article was published also in The Jerusalem Post online (20 June 2017) and in the printed edition (pdf format, 21 June 2017).